One of the hottest Realty Markets in the Ann Arbor Saline area and a commuters dream, the area made up of York Township real estate in Washtenaw County in Michigan attracted settlers as early as 1752, but it was not until 1789, when Chief Okemos of the Chippewa Native Americans signed an agreement allowing white people on Indian lands, that settlements became more permanent. In 1824 the township was officially recognized but was not allowed to incorporate because it lacked major staples of a self-sustaining town. In 1831 York Township began stabilizing with the construction of its first schoolhouse and in 1834, the township was incorporated at the convening of the Territorial Legislature in Detroit. The township began to grow quickly as droves of settlers moved in from the 13 original colonies and the surrounding regions. The township was named after New York because most of the settlers in the region came from that state during its initial growth in the 1820s and up through incorporation. The majority of the residents in the township during its initial stages of growth were German, but the township has since become more varied in its population demographics. York Township real estate has low property taxes and is located near some of the area’s best shopping and dining options including those found in Ann Arbor and others located in Saline. Shoppers can experience the best of Michigan at My Urban Toddler or at the Nature’s Garden Center, both in Saline. Saline is only 5-10 minutes from York Township and provides residents with access to small town shopping fun without having to worry about living too close to a big city. The Briarwood Mall in Ann Arbor is only 10-15 minutes from York Township and provides residents access to all the best in national chain clothing stores and other goods including Abercrombie and Fitch, Apple and even Coach. Great dining near York Township can also be found in Saline. Residents enjoy excellent American fare and seafood at full-service restaurants like Mac’ Acadian Seafood and Brecon Grille. There are also many nearby chain full-service and fast food restaurants including Ruby Tuesday, Taco Bell, Subway and McDonald’s. Ann Arbor offers a wealth of outstanding eateries, from Zingerman’s deli to the Gandy Dancer (located in a historic train station building) to Yotsuba Japanese restaurant. 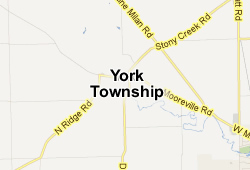 York Township real estate is situated on a small area of land just 35 square miles in total. But this small area still has plenty of recreational activities for residents to enjoy. Sandra Richardson Park boasts some of the county’s best soccer fields for children’s leagues and Sunday-afternoon games, and walking trails that cut across the park into the woods and over the prairie. Picnic pavilions are also popular in this park and many covered gazebo areas provide respite on both sunny and rainy days. Mary McCann Park is made up of more than 50 percent wooded area, and walking paths allow residents to observe the county’s diverse wildlife in its natural habitat. Fields and ponds in this park also provide access to a relaxing afternoon for many residents. For those residents who have a different kind of green in mind, there are multiple golf courses in nearby Saline. The average value of York Township real estate in early 2012 was $156,000 for a home or condo. Residents in this small township typically work in education, healthcare, professional or scientific services and in accommodations, though many residents also work at the Federal Correctional Institution in Milan or at Toyota’s local facility. Many residents also commute to nearby Ann Arbor for work at the University of Michigan and the multiple medical facilities in there. York Township is located just a few minutes from Saline where many residents do their major shopping and dining and is just 26 minutes from Ann Arbor, the closest large city with major attractions. The township is less than one hour from Detroit and just over one hour from Ontario, Canada. 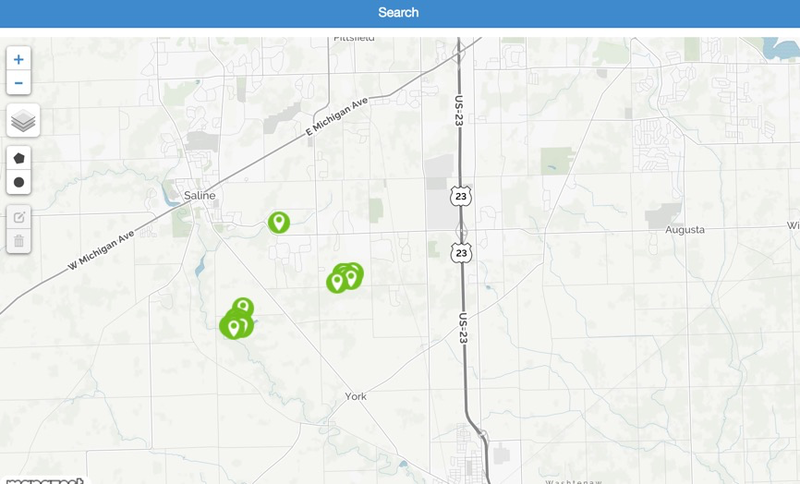 The Milan area schools and Saline area schools service York Township real estate, and students living within the township are bused to these neighboring towns for their educations. There is one private school within township limits; the South Arbor Academy has a small student population and was opened in 1999. The closest hospital to York Township is the St. Joseph Mercy Hospital located in Saline or residents can travel to Ann Arbor for treatment at the University of Michigan Hospital. For those residents who do not work at the local Toyota facility or for the corrections system, most drive the 15 minutes to shops, stores and services located in Ann Arbor. Many residents who work within township limits utilize the on-demand door-to-door bus system as an alternative means of transportation. The area is very popular with commuters being just 5 minutes from the US23 - I94 expressway interchange and east of the Ann Arbor rush hour traffic backups. Please contact Tom Stachler to setup a showing appointment if you see something interesting or have any questions about any area surrounding Ann Arbor. If you are thinking about buying York Township real estate or selling a home in Milan or Saline, give us a call at (734) 996-0000 or send us an email to explore your options and to find out when is the best time for you to make a move.